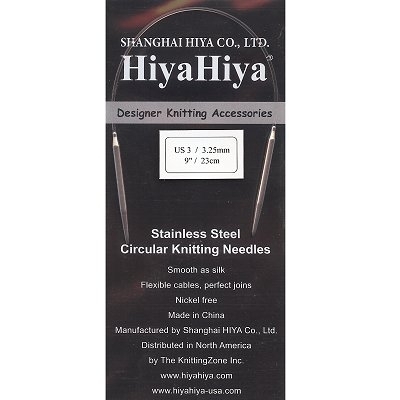 HiyaHiya’s 9-inch stainless steel circular knitting needles are smooth as silk and made with flexible cables and near perfect joins. They’re the perfect size for knitting socks. The tips on the needles are approximately 1.75 inches. Love them. As others have stated they take a little getting used to but I'm using them now to knit my stranded Fiesta socks & they are working beautifully. Started using these needles as soon as they arrived on my stranded socks project. Took a little getting used to, but now they feel perfect! I love using these small circulars for knitting socks. The needles are flexible and easy to work with, and the needle part is smooth and wonderful. The joins are perfect, and the yarn glides right along. I own a bunch of these in various sizes and use them constantly. Love them. These take a bit getting used to, but I love them. Tried the bamboo ones, these have better tips. Makes sock knitting go faster. I love my baby needles! They are so fun as I'm making socks with them. Thank you and I got them super fast! !